Dee Palmer is an English composer/arranger, pianist and author. A comparatively late starter to consider a career in music – her first, formal music lesson was not until she was over eighteen – once underway though, her progress was meteoric. Dee studied at the Royal Academy of Music in the 1960’s. Her principal instrument was clarinet and though a promising orchestral career soon beckoned – by the end of her second year of study she’d already won the Boosey and Hawkes Prize for woodwind, performed concertos and numerous chamber works and had been appointed Sub Professor of clarinet. 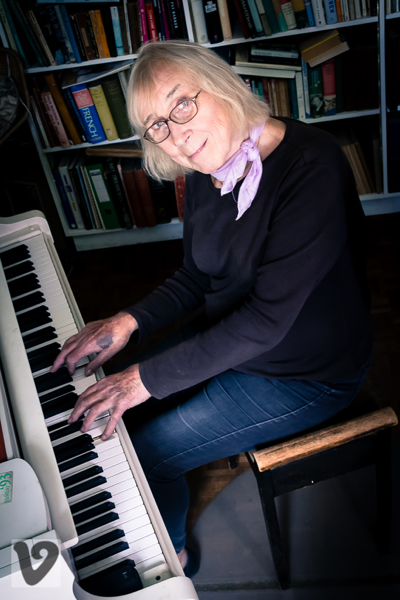 Dee gave up the instrument to concentrate on developing her natural keyboard and compositional skills, studying harmony and counterpoint with Patrick Savill and composition with Richard Rodney Bennett. She was awarded the Eric Coates Prize for composition in 1968. Whilst still a student at the Royal Academy she was appointed guest musical director of the Cambridge University Footlights, performing both on tour and on Broadway, New York. Her career (which began as ghost writer for a leading film music composer) has included writing and performing music for Film, Television, Records, Theatre and the concert hall. From 1968 until 1980 she was arranger and, subsequently, keyboardist with the globally prestigious, seminal English rock group, Jethro Tull. On leaving the group she produced an acclaimed series of albums of symphonic versions of prog-rock music of the 70’s – Tull, Genesis, Pink Floyd, Yes, Queen etc. – performing them, live, in Europe and the Americas throughout the 90’s. Currently working on a variety of projects including her autobiography and a long awaited album of original songs, she has recently completed the choral arrangements of songs from three of her series of symphonic rock albums, with a future “Prog-Rock Prom” performance in mind. Appointed a Fellow of The Royal Academy of Music in 1994, Dee Palmer now lives in Shropshire with her magnificent Scottish Deerhounds, Stig and Barney.